Chicos & chicas, I’m burnin’ out! Only two more posts and I’ve met my goal, but good heavens, it’s getting to me (along with the sleet and grossness outside). 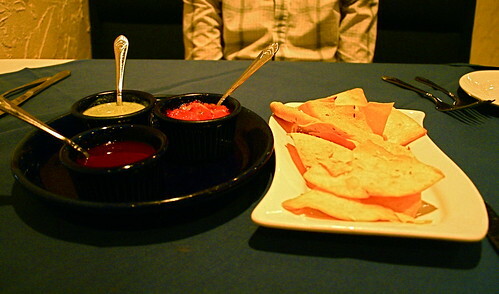 So here’s a photo essay of the goodness that is Taaza–the other Indian restaurant in Roanoke (and the only one in which you can order a dosa–thanks be). Authentic, mostly-South-Indian cuisine with a dash of other regions mixed in, Taza is the restaurant I tend to forget about all too often. And I shouldn’t, because their dosas are to die for, their curries impeccable, and their wine selections, though lacking, aren’t all that bad. It’s a treat to have a restaurant like Taaza–one in which I can always order something new and always be surprised by the quality and taste–and, hey, who doesn’t lik a weird nightclub turned Indian restaurant? The fancy bar and round dance floor area are pretty darn awesome in my book! Your posts have been amazing! Inspiring that your going to pull it all off! 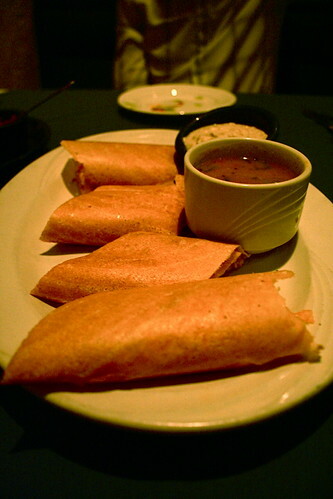 The dosas look great. I love Indian food! I wish that was my lunch right now! And I am burnt out too, hooray for the end of VeganMoFo! 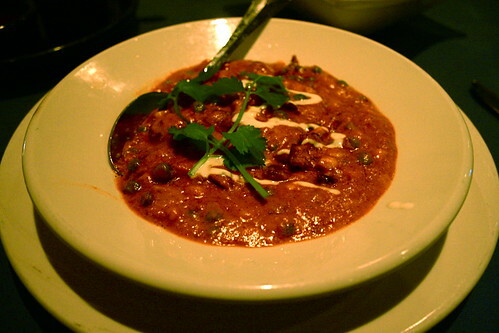 Yum, I haven’t had Indian food in awhile, it looks delicious! I’ve forgotten how good it is, thanks for the reminder. You’ve done a great job on MoFo! looks yummy! i wish we had more indian restaurants around here.